Qualifying at Phoenix International Raceway for the AdvoCare 500 saw Stewart-Haas Racing regulars Tony Stewart and Ryan Newman both earn top 12 starting spots. Stewart qualified the No. 14 Mobil 1/Office Depot Chevrolet Impala ninth for the race with a speed of 136.867 mph (26.303 seconds), while Newman qualified the No. 39 Quicken Loans Chevrolet 12th following a qualifying lap of 136.721 mph (26.331 seconds). 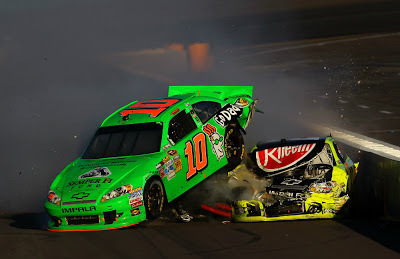 Danica Patrick, driving the No. 10 GoDaddy.com Chevrolet in conjunction with Tommy Baldwin Racing, qualified 37th for the race at a speed of 132.954 mph (27.077 seconds). Stewart spent much of the race in the top 15 before spinning on Lap 282 and sustaining damage to the left-front of his Chevy. The crew was able to repair the damage and get Stewart back on track just one lap down. He went on to finish 19th. Newman and Patrick both had better finishes than the boss, but limped home with torn-up race cars. Newman and his new crew chief Matt Borland were once again able to earn a great finish under problematic conditions – namely that Newman crossed the finish line backwards. He fought handling issues early in the race, racing mid-pack until Borland’s call to stay out during the caution on Lap 166 put him in the top three for nearly 40 laps before having to pit. Pit stop strategy and adjustments put Newman back in the top 10 with less than 20 laps to go, with Newman ultimately finishing fifth. That he was able to finish was another matter. Patrick’s career-best day was overshadowed by her involvement in the final wreck of the race. After the red flag for the incident between Clint Bowyer and Jeff Gordon, Patrick was running in 14th place on the restart when she was tagged by Jeff Burton. Patrick bounced off the wall between Turns Three and Four, leaking oil along the frontstretch as she tried to get down to the apron. No caution flag was thrown, and as the rest of the field came through Three and Four to take the checkered flag, the slipping and sliding began – winner Kevin Harvick and runner-up Denny Hamlin skidded through the final turn, but many of those behind them weren’t as lucky, and Patrick and Newman, among others, were caught in the middle of the game of bumper tag. Patrick did go on to finish 17th, but crew chief Tony Gibson thought the result would have been better. Stewart’s 19th-place finish dropped him back to ninth in points, with all drivers except the top two, Brad Keselowski and Jimmie Johnson, eliminated from contention in the Chase for the Sprint Cup. Newman sits 14th in points, 82 points back of Kyle Busch.